When choosing a lamp, it helps to factor in the design of the whole room, even if you are just thinking of a single table lamp, floor lamp, or pendant lamp. A few simple design tricks can make choosing a lamp so much easier. Whether you’re choosing a lamp or designing the lighting plan for a whole room, it helps to take stock of what already exists to keep the lighting consistent. Note the finishes in the room, as well as the style of your favorite piece in the room. If you love your modern sofa, you probably wouldn’t want a rustic table lamp beside it. For traditional decors, shiny, smooth materials tend to be more formal. Think brass, crystal, or porcelain. Traditional shades are often made of silk with more details. Rougher textures and finishes create a more casual feel. Casual lamps might be made from wood, textured ceramics, iron, or stone, with shades made from textured linen or cotton weave. Clean lines tend to be more contemporary, so materials such as brushed chrome or other metals, glass, and cast resin or stone lend themselves to comtemporary designs. Bear in mind that shades change the color and brightness of the light in the room. If your lamp’s duty is to provide plenty of light for reading or to illuminate a dark corner, then a high quality, translucent paper or linen shade can provide diffuse light. How many lamps do you really need? Well, a properly lit room needs a lamp every 50 square feet or so. At that spacing, a 12’ x 20’ room needs about five lamps. However, a general rule of thumb is that every room should have at least three lamps to keep it from looking too mysterious. Dark walls or furniture tend to absorb light, which means they require even more lighting than rooms that start with a lighter palette. Table lamps like Bassett Furniture’s Rowan Table Lamp are designed to sit on an end table, sofa table, console, or even a bedside table. When choosing a lamp for any table, consider the height of both the table and the lamp to make sure the lamp illuminates what you want to see, but doesn’t shine in your eyes. The rule of thumb is that table lamps work best as task lights if the distance from the floor to the bottom of the shade is around 38" to 42" (to avoid glare from the lightbulb). Make sure the table lamp matches the scale of both the table and the space. Large tables usually need large scale lamps. And keep in mind that most table lamps need ample desk or table space, or they may feel crowded. Floor lamps are another lighting option for spaces where there is no table, or where a table lamp might be knocked over. These standing lamps work ideally in corners, and should be positioned out of the way of heavy traffic. Equally suitable for either ambient or accent lighting, floor lamps allow flexibility in both function and style. Floor lamps like Bassett Furniture’s Dwight Adjustable Floor Lamp make a good reading lamp next to a favorite reading chair. With any floor lamp, the bottom of the shade should measure about 47" to 49" above the floor to prevent glare. Pendant lamps vary in size, from small task lights to larger pendants that light dining tables or foyers with high ceilings. Pendants provide great task lighting over counters or tables in a kitchen, dining room, or game room where you often need more light on the chopping block or the poker chips. On the other hand, a pendant lamp can also provide ambient lighting in nearly any room – kitchen, living room, foyer, bar, or any room that could use more general lighting. Bassett Furniture’s Odense Glass Pendant lamp complements nearly any style, from rustic farmhouse to industrial. The typical height for hanging a pendant lamp over a table or a countertop is about 30 inches from the surface. This varies a bit depending on the fixture and the space, but the important thing is that people seated at the table or counter can see everyone, and that there is no chance someone will run into the pendant. Whether you choose a table lamp, floor lamp, or pendant lamp, invest in high quality lamps you love and you will live with them for a long time. Although you may swap the shade or the finial somewhere down the line, you will move a favorite lamp from room to room and even home to home. 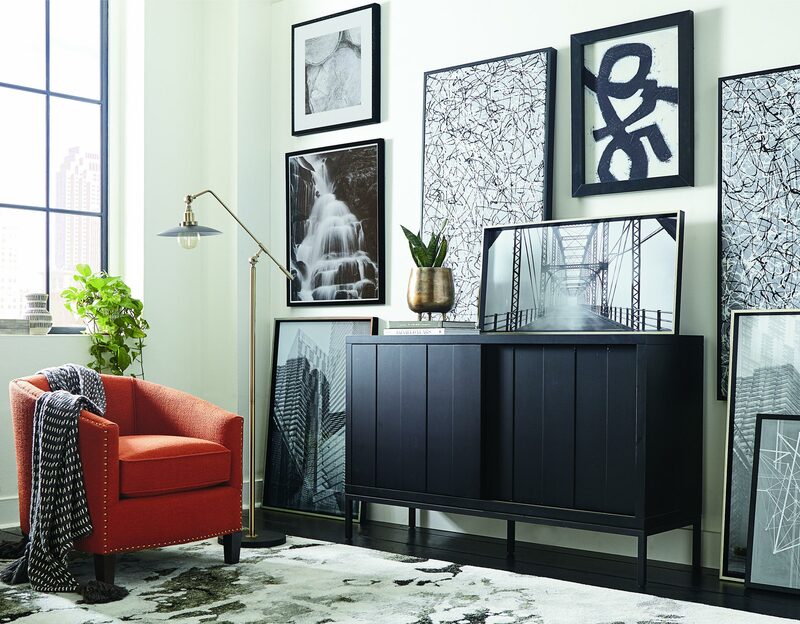 Shop the Bassett Furniture Lighting collection for more inspiration.